Fast healthy dinner recipes so you can enjoy your food without guilt. Fast healthy dinner recipes means buying a pressure cooker, in my opinion. It reduces the cooking time by two thirds and, because I'm a greenie, that means reducing your energy bill significantly too; lessens your carbon footprint. This page is in development, so you'll have to be patient; visit periodically. This page was last updated by Dr Bernard Preston on 20th November, 2018. The emphasis here is on speedy yet healthy; or, as we put it, slow food made fast. For some that mean seem a contradiction in terms, but with a little planning it can be achieved. For example, chickpeas which are for me the best meat substitute, need to be soaked overnight, and then pressure cooked for half an hour, can be frozen and instantly available. Many of these healthy dinner recipes, we'll present first in the usual way, and then pressure cooked. For example, our first meal is a chicken dinner. Normally it would take an hour and half in the oven; that's how it's presented below. 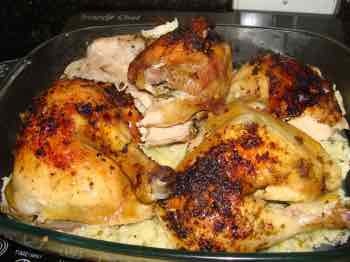 But by pressure cooking first for say twenty minutes, and then roasting for half an hour, you've reduced your time to under an hour. This Indian Saag recipe is rich in spice but low in spicy heat; it's a simply delightful way to enjoy spinach and kale, the two greens that lead the way in preventing age onset macular degeneration. The freshly ground cumin and coriander bring to the fore the Eastern herb flavours without it being chili hot. Enjoy it as a vegetarian dish, or use a chicken bones stock. Bobotie recipes hail from the Malay people in South Africa; traditionally it's just red meat, onions, spices and bread but we add chickpeas and sliced vegetables that are in season. 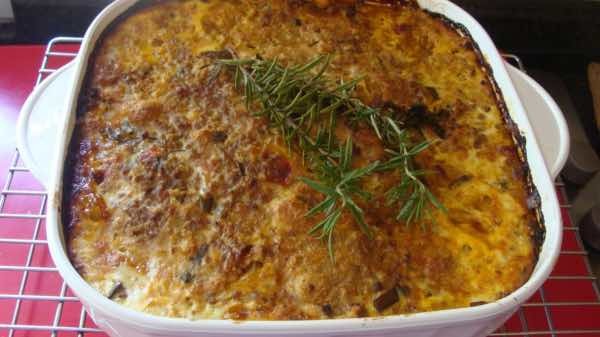 These bobotie recipes take about twenty minutes to prepare, and forty-five minutes in a hot oven. New potatoes have half the starch of those from cold storage; even in many diabetics they do not cause a spike in blood glucose at the two hour test, though each insulin resistant person is different and has to assess himself. Leave them overnight in the fridge, and reheat, and they will retrograde, the starch passing through the small intestine to the colon where it does not form glucose at all. Find the ingredients for braised new potatoes; they are one of my favourite fast healthy dinner recipes, taking about 45 minutes to cook; but you are actively busy for probably little more than five. Kale and legumes combine together beautifully with various condiments to make a wonderful, very quick to prepare, salad or dinner. Is has the benefits of the dark green leafy vegetables that we must enjoy daily, like them or not, or suffer from a range of many ailments the pick of which is macular degeneration; kale is the richest source of lutein which is the phytochemical along with zeaxanthin that are found in the eye preventing cataracts and blindness. Look no further than red meat for the source of the cancer that bedevils every other family. In season, drop young broad beans into the pot first, for five minutes before steaming your kale; the combination of vegetable protein and greens makes a wonderful fast healthy dinner recipe. Not that we are vegetarians, but enjoy chickpeas daily and red meat a maximum of twice a week. These recipes for cooking kale are virtually daily on the menu; you can enjoy the young leaves raw too. What is kale good for you may be asking. One of these easy eggplant recipes are regularly on the fast healthy dinner menu; I will acknowledge that it's a bit of an acquired taste. And, when they are old, they are simply terrible; like most vegetables. It's so easy to be put off for a lifetime just because of one bad experience when young; just think of all the folk who hate lettuce salads; so hard to get fresh greens. As a child I was once forced to eat old broad beans; refused to touch them for fifty years; now I've discovered that fresh, they are absolutely lovely vegetable protein. And it's the same with what we call aubergine in Holland; but this fried eggplant recipe is one of my great favourites. 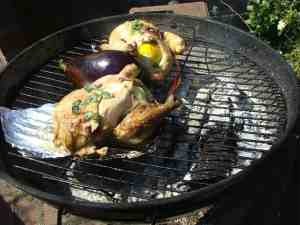 The simplest way to cook them is just to drop one onto the BBQ; see it between the chickens? Peri-peri chicken is a great food, and believe it or not the capsaicin in chilis acts as an anti inflammatory agent for your joints and muscles. Those like us who have chickens in the garden will know that half the darling chicks will grow up to become raucous, rapacious cockerels; the hens will have no peace until your grit your teeth and prepare the beast for a long slow cook in the oven. One of the carotenes in eggplant is especially good for lowering cholesterol. Corn and beans is as old as Methuselah. A variation I much prefer is corn and chickpeas, in particular with hummus. Like most vegetables, the sugars in corn are changed quite rapidly into starch, which is why we don't particularly like them. There's nothing more dull than old beets or corn. The secret is how to grow corn. Then straight from the garden, into the pot and ten minutes later onto the table with a good scoop of homemade hummus, and you have the perfect fast dinner. This quick succotash recipe might interest you; it brings back childhood memories to me. Twenty minutes from start to finish; better still learn about growing lima beans; but that's not quick. Of course, it might also just be the starter for a meat dish with young zucchinis or swiss chard. No potatoes though; you don't want too many carbs. That's just a recipe for all the nasties associated with you know what. Knee pain is amongst the worst, like patello femoral pain syndrome. Our authentic hummus recipe is so easy to make by the way; it takes me only five minutes, twice a week. It doesn't keep. On a green salad as one of our fast healthy dinner recipe, it will cure you of heartburn and indigestion. We're always on about getting more of our protein from legumes; there's so much research about red meat causing cancer. Gigantes butter beans recipe is a wonderful Greek recipe that will do all of us a power of good; they are also known as limas. Cockles and mussels, alive, alive, oh, alas are not available the world round, but if you can lay your hands on them they are a very fast, healthy dinner recipe. The only part that is time consuming is testing that each mussel is alive and healthy; those with cracked shells must be tossed. I don't have fond memories of Bruge in Belgium; I had a severe 3 day diarrhoea after having mussels as a restaurant, and wouldn't touch them for years. But, if you sort through them carefully, they are a very rich and delicious source of vitamin D and omega-3. The actual steaming of recipes for mussels takes no time at all. They are one solution to the enigma that is food rich in vitamin D; sunshine has it's dangers. I know lamb is red meat with the attendant difficulties, but there's by and large one great difference; unlike beef and pork it's usually free range. I often wonder if the warning associated with food from the butcher pertains only to those animals that have had the misfortune to be raised in feed lots and sties, and described as corn fed. Sheep on the other hand are usually allowed to roam on the thousand hills. This lamb stew, as described at our what is mutton page, is to die for; add some chickpeas, and perhaps a few leaves of spinach, and it makes a place amongst our wholesome and very tasty fast healthy dinner recipes. Roasted chicken on cauliflower is just perfect for those who are banting. Some like it hot, so growing and knowing how to preserve jalapeno peppers is essential; it's so easy. With a lot more people dying of obesity than starvation in the world, we should all be avoiding high glycemic foods; those that produce an insulin rush. Whilst I'm not suggesting that potato should be thrown out, let's look for substitutes that are delicious and healthy and keep spuds for high and holy days. New potatoes incidentally have much less of an effect on our blood glucose; if you can find them, they can be included in you fast healthy dinner recipes. I'd like to stress that our food needs to be pleasurable, tasty and delicious; but it also should be healthy if you want to live long in the land, and not be taking a bucketful of pills every day to lower your cholesterol, blood pressure and sugar. These fast healthy dinner recipes are almost without exception low GI meals. They won't be fattening seen in the context of the whole meal; it's my desire that you can eat and enjoy your food without being constantly worrying about calories or, worse still, becoming a health food neurotic. How much you eat is certainly a factor, but far more important is the quality of the foods. Don't avoid fats, they are essential for your brain and nerve conduction, but do try to stick to the healthy ones. That means the olive and avocado, and butter in moderation. Personally I won't touch margarine, and I try to avoid the solvent extracted oils; use cold pressed if you can find it. Another of our not so fast healthy dinners is this recipe for sesame chicken. Introducing hens to our garden has given us a whole new dimension to healthy food; read more at best chick food. In the context of fast healthy dinner recipes, we're eyeing those young cockerels! I'll give it a whirl in the pressure cooker one of these days. That will reduce the cooking time by two thirds, and the energy consumption. If you keep a supply of frozen garbanzo beans in the deep freeze, which I strongly recommend, then this high protein chickpea soup recipe is going to be regularly on the fast healthy dinner recipes list. Add your favourite herbs as chickpeas don't have much flavour; thyme herb benefits. 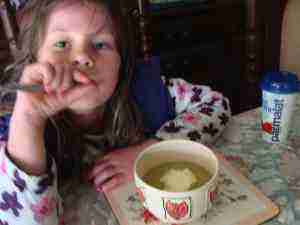 Even the kids love it, and you can even afford to add a dollop of cream.Fast health dinner recipes are about getting back to these basic meals. An old favourite, plain boiled potatoes, sadly have unnecessarily been banned by many of the diets; the dieticians who came up with these crazy fads that don't work anyway, and they had no knowledge of the science behind reheating resistant starch; here you'll find a delicious recipe for old fashioned potato smash; gran did have it right after all. As one wag put it, don't eat what your mother used to put in front of you, but returned to what your grandmother did; and Speedy Mash was definitely not something she put on the table in front of you with her fast healthy dinner recipes. Green chilis and chickpeas make a wonderful sauce; enjoy it on mashed potato, or as a side dish with a salad. If you like it hot, choose longer, more mature red chillies; short, green, young ones are not particularly fiery. If you have the chickpeas in the deep freeze you can make this green chili sauce recipe in a jiffy. And if you don't have packets of garbanzo beans in your freezer, then cooking chickpeas is a very important page if you want to keep your cholesterol down, and stay off statins. Alcohol is part of most dinners. Mine too but let's not forget that beer makes a good servant but a very bad master. Luckily, despite being prediabetic, in the context of the whole meal, it doesn't raise my blood glucose abnormally. Surely every beekeeper has tried his hand at making honey mead; lovely with a light supper. One certainly should avoid a dessert every night after supper, but if you've had one of our fast healthy dinner recipes, then you can certainly indulge your sweet tooth occasionally. Just a couple squares of chocolate is fine, if the caffeine doesn't affect your sleep, and if you can avoid the temptation to finish the 200g bar! Or this really very easy homemade vanilla ice cream. The portable ice cream freezers are really inexpensive and enable you to avoid all the crap that is added to the commercial desserts. I'm astonished how few folk have a pressure cooker. It reduces cooking time by two thirds. And if you want to save the planet, that means a lot less energy being used too. If you want to go the whole hog, then you can power it by the sun with solar pressure cooking, but just the old fashioned method is just fine. If you're a busy person, this is a must. Chicken in half an hour? Pay a little extra and get the stainless steel one. 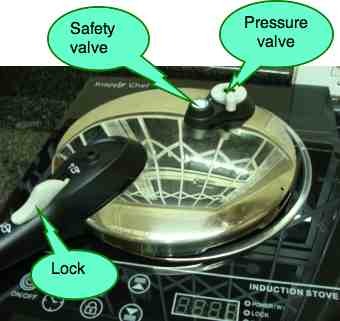 Ever seen induction cooktop stoves like the one above? Much faster than either gas or a conventional hob. And less than half the electricity. All our heating will be like this before long. Pressure cooking and induction stoves are to my mind an essential part of fast healthy dinner recipes; neither are expensive. We use ours regularly for how to cook beetroot; otherwise you need nearly an hour; got that amount of time for this wonderful vegetable? It's what finally cured me of very serious constipation; that means polyps and peritonitis and a very sick large intestine. Speaking of the colon, scientists are finding that the bugs in our intestine, the microbiome, friendly bacteria and yeasts, are supremely important for all parts of the body. We use kefir benefits; simple and cheap. No one seems quite sure when to take them, so it could be a part of fast healthy dinner recipes, but we have ours at breakfast for convenience. When you turn down a supper date, or won't go with friends to a restaurant because they may have used this or that in their cooking, or insist on taking your own food along, then you're on shaky ground; fast healthy dinner recipes will certainly be better for your body, but there are signs the mind is taking serious strain. Whilst I'm crazy about healthy food and I'll admit to the fact that there are some things that I simply won't eat, when it causes you to become antisocial then you're on the verge of what's known as orthorexia; it's a serious eating disorder, a second cousin to anorexia. Read more about it, if you dare, at health nut neurosis. If you refuse, then you've definitely got the affliction! 1. Resistant starch content of potatoes.